Here's a quick way to deal with hunger pangs after a day at work using just a few things that most of us will be able to assemble at any point. The humbly chicken mayo sandwich. What I love about sandwiches, is that like salads, they are extremely versatile. You can use a number of ingredients or leave out certain ingredients according to what you like or dislike and you can literally do no wrong. So even those of you who have never cooked before will be able to put this together. Serve it with a piece of fruit or some yogurt and you have a decent packed lunch. Honestly, I love a working lunch like this rather than having a fussy meal. I don't mind something more elaborate for dinner. This sandwich is really simple to put together if you keep a few things at hand. For example, having some leftover grilled or roasted chicken is a life saver. But even if you don't here's what I do. I simply marinade a chicken breast, cut into smaller pieces with some salt, a dash of lime juice and some ginger garlic paste for about 15 minutes and I add some water (not too much) and boil it till its done. You can then keep this refrigerated till you need to use it. 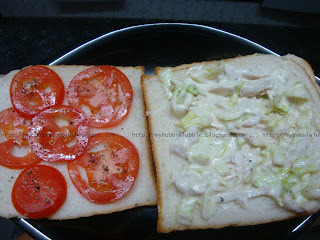 Mix the mayo, chicken and lettuce and spread this on one of the slices of bread. Placed the slices of tomato on the other and season with some salt and pepper. Place one over the other and enjoy. Deliciously prepared chicken mayo sandwich. Looks yummy! Trisha, some of the most delicious things are also the simplest. I love the fact that you make a homemade mayonnaise to partner up with your beautifully marinated chicken breast and the way you season the tomatoes with s&p! Perfection!